That’s where a little creativity comes into play. By thinking outside the fold, marketers have found ways to make readers take a second glance at these ads. 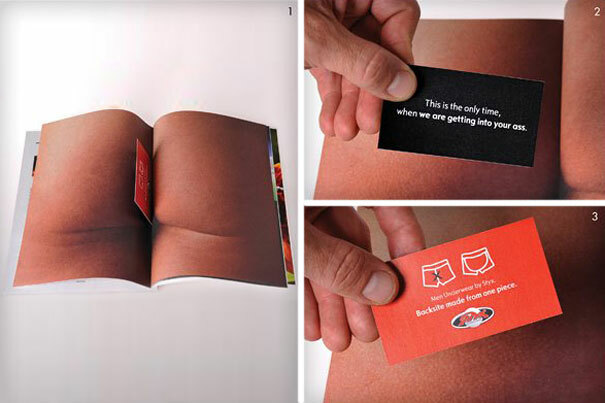 Take a look at 40 amazingly creative double page magazine ads and let us know which one would make you stop and take a second look! Post it glue was used to give the impression that icecream and tomato sauce from a hotdog had stuck to the shirts of people on the opposite page. By the time the page was opened however the stains were back on the icecream and hotdog. Jamshop has created a cheeky DM piece to complement their existing national print and online campaign in an effort to recruit sperm donors for Repromed, Australia’s leading infertility clinic. Unsuspecting potential candidates received the popular men’s magazine FHM, only to discover that some pages appeared stuck together. Blokes were lured into pulling the sticky pages apart, revealing a full page pic of an attractive lingerie model and a message. An interactive website linking back to Repromed challenged the men to see if they had the “goods” to become an eligible sperm donor. STYX underwear: only time Styx Underwear for men has a special character – offers a unique design that ensures that no part of the cloth will get entangled, in the middle of a man’s rear end (buttocks). The double page spread was glued together and had to be forced apart to see the ad. The ad appears on two consecutive facing page of the magazine. The first page shows a cute smiling girl. The second page has the photograph of an old woman. When readers turns the page, he/she realizes that the girl’s eyes are actually the old woman’s eyes. He/she also sees the message, “Donate” and logo of National Association for the Blind on second page. Thus, driving home the point in a very simple, endearing and effective manner. Your Life can turn in a second. Pingback:Some of the Best Magazine Ad Spreads – SNAP!